Flawless Carpet Cleaning is a family run business with a focus on old-fashioned customer service. 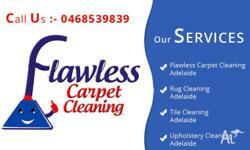 We specialize in cleaning carpets, tiles, and upholstery in Adelaide. Flawless use the latest equipment and the right chemicals to ensure the best clean possible. Our chemicals are also child and pet safe.